Capitalism normalizes, destroys and kills. 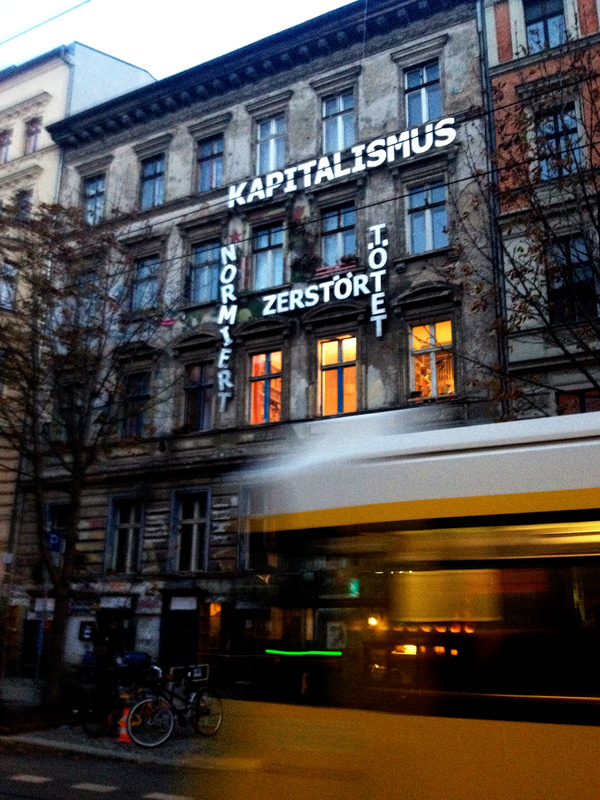 1) What is most urgent for the radical movements in Berlin right now? What is happening and what should or could happen next? 2) How can people, new in relation to the movements or the city, take part in the political actions in Berlin? 3) How would you describe contemporary German activism? What do you think are the biggest problems in the German movements? 4) How can we organize ourselves across Europe, and what are the most central problems in this project? 5) Do you think that Blockupy Frankfurt can play a central role in organizing the European movement? 6) What sort of concrete actions could take place in the German and in the European framework? What would you wish to happen? 7) How would you describe the most central problems of our capitalistic society? 8) What would you like to say to those listeners, who wonder, how they could participate in political movements, in the building of a new world without debt, shame and capitalistic repression? This programme is not live, but you can still comment it by commenting on this article. Let’s get radical and make the world a better place every day!